But here’s the thing: The title of the book is THE Green Lantern, implying there can be only one. Yet Hal’s out and about with an entire Corps at his side. Meanwhile, the Almighty appear to appear in time for the auction, winning the Earth that he may enjoy its eventual destruction. Needless to say, it is not the Almighty but another alien being with god-like abilities (and Hal should know this since they met before when he died). 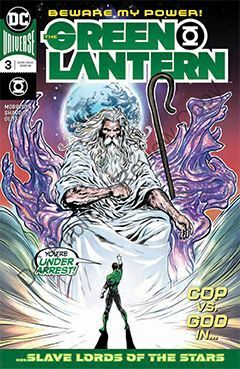 Grant Morrison has a reputation for taking his characters into some dark corners, but in this title, it’s as if he doesn’t know Hal Jordan at all. With other characters, he could get away with a lot, but this is one of the pillars of the DC Universe we’re talking about. Twisting him in ways he was never meant to go will only last so long. I am enjoying Liam Sharp’s artwork, in which he gives the heroes the over-muscled physiques we used to see back in the 1970s and ‘80s. 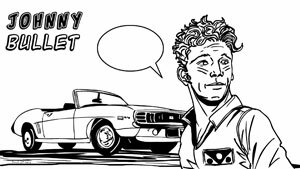 But as a big a fan as I am of that era, seeing it presented now makes me grateful comic book artists of today have moved on from that. All in all it’s a flawed book. But I can’t say I’m really surprised. DC had a good thing going with Hal Jordan and the Green Lantern Corps and Green Lanterns. But they chose to “fix” them, when they really didn’t need fixing at all.